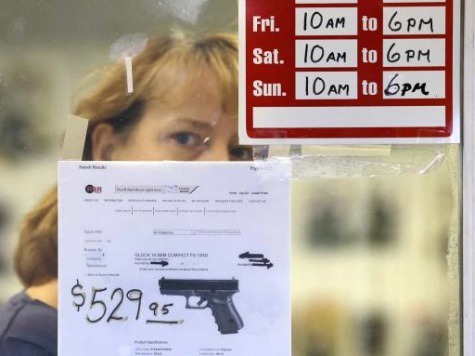 A group of California gun store owners are challenging a state law which bars them from using photos or images of handguns to advertise in their own store windows. These gun store owners claim the law infringes on their First Amendment rights on its way to harming their Second Amendment rights as well. Ironically, the image of an AR-15 is reportedly allowable under 26820. So the same store that cannot advertise a Smith & Wesson M&P Shield 9mm handgun, or a Glock 42, can put up images of a Bushmaster AR-15 rifle with no problem. In fact, Tracy Rifle and Pistol, in Tracy, was recently cited by the California DOJ for putting an image of a handgun in one of its windows, yet the image of an AR-15 in the very next window was just fine. Tracy Rifle and Pistol owner Michael Baryla told KCRA that he put the image up so would-be customers would know what kind of guns he sells. He said it’s “silly” that he is allowed to advertise one type of gun but not another, especially when he sells both types of guns.